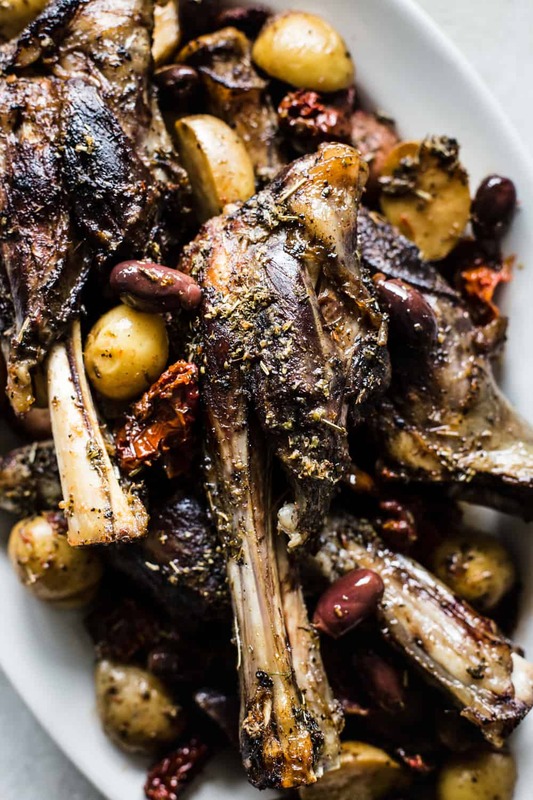 Slow Cooker Greek Lamb Shanks are fall off the bone tender and rubbed in the best greek spices. Potatoes, sun-dried tomatoes, and kalamata olives all cook to perfection in the slow cooker and make such a delicious meal in one! Easter is right around the corner and let me ask, lamb or ham? We have always been a ham sort of family on Easter but I am all about trying new things. This year we are having lamb! 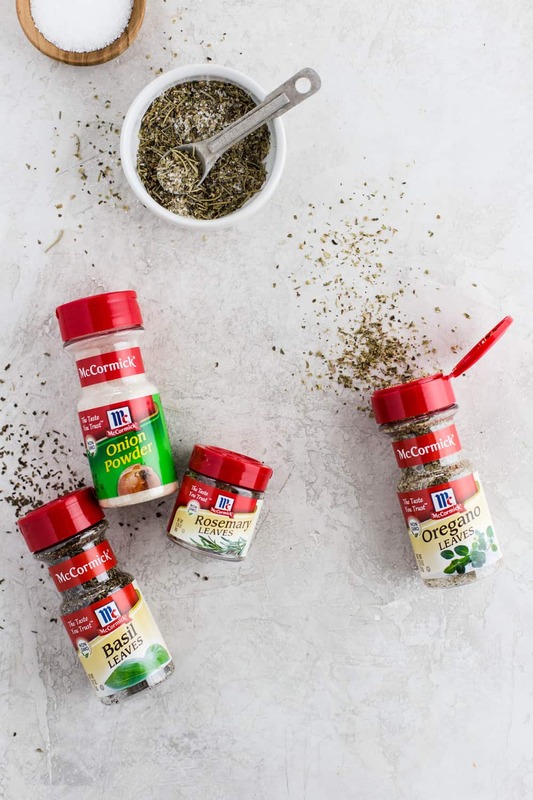 Whether you are having ham or lamb on Easter, try a new seasoning to really amp up the flavor of your dish. 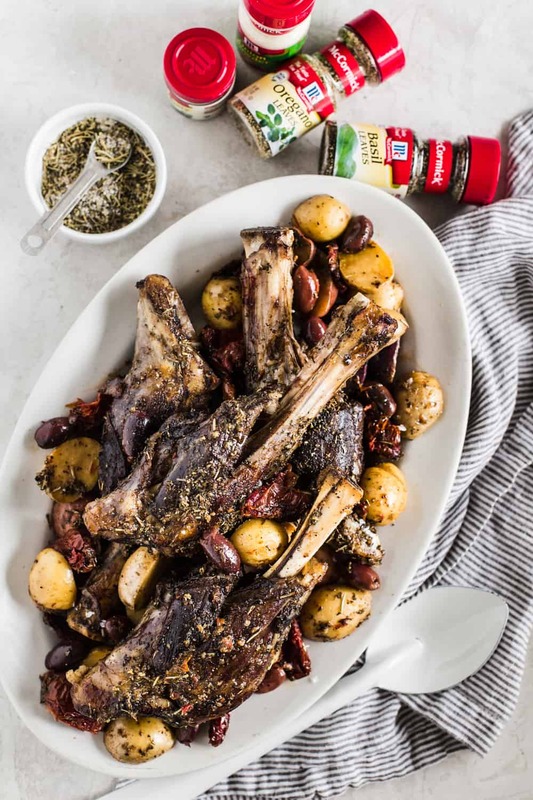 McCormick’s bold spices were used to create this amazing greek spice rub for the lamb, and the flavor is out of this world! Making a tasty and nutritious meal does not have to be complicated especially when you use your slow cooker! 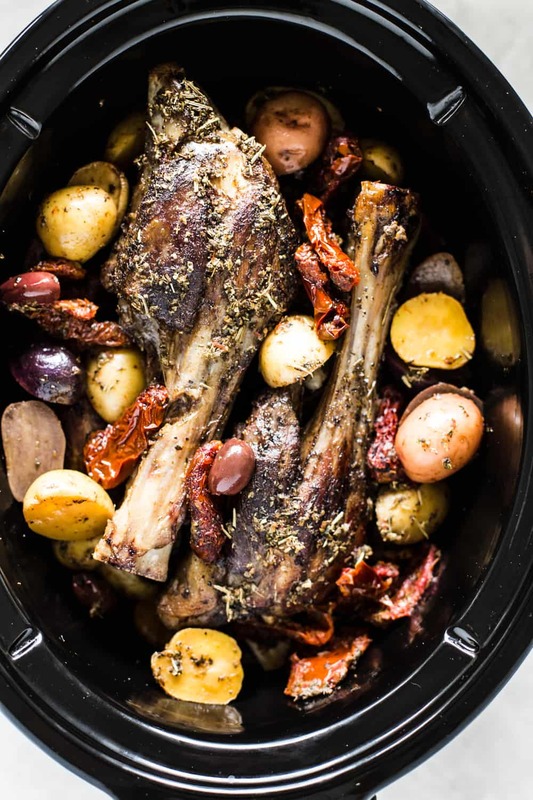 Your lamb will be the star in the slow cooker infused with greek seasoning. It will slow cooker to tender perfection and have the best savory flavor. What spices are used in Greek seasoning? Herbs such as rosemary, oregano, basil, onion powder, salt, and pepper all make their debut in this greek spice rub. After you sear the lamb shank you will rub it in the spice rub and then allow it to cook to perfection. How do you cook lamb in a slow cooker? Start by putting your potatoes, kalamata olives, and sun-dried tomatoes in the bottom. Pan sear the lamb shanks until brown and add to the slow cooker. Rub the greek spices on the lamb shanks and add to the top of the slow cooker. Add chicken broth and lemon juice. How long do you cook a lamb in the slow cooker? Turn your slow cooker on low and cook for 8 hours. Or you can turn it on high for 1 hour and cook it for about 6 hours. Your family is going to go crazy for this fall of the bone tender lamb meat. It has such incredible flavor and seasonings. It is so nice to let the slow cooker do all of the work and free up the oven for rolls or other side dishes you will be creating for your feast. It makes the perfect meal with the potatoes, sun dried tomatoes, and kalamata olives. This greek flavored inspired meal is perfect for your holiday feast! 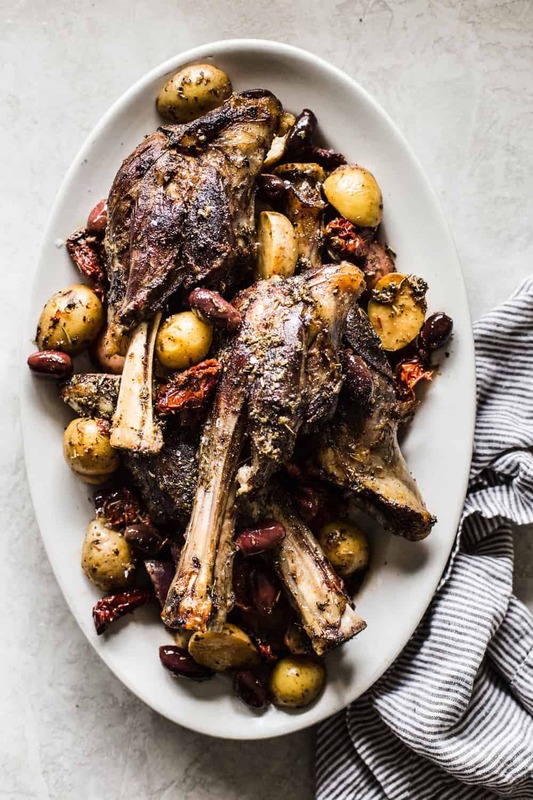 For more recipe inspirations like this Rack of Lamb with Quinoa-Hazelnut Crust and Mint Pesto, Electric Pressure Cooker Lamb, or this Slow Cooker Ham, Spiced Orange Glazed Ham, visit McCormick! Heat a large heavy skillet with the olive oil. Season the lamb shanks with salt and pepper. Brown the shanks on each side. Add the potatoes, olives, sun-dried tomatoes and salt and pepper. Add chicken broth and lemon juice to the bottom of your slow cooker. Add the lamb on top and rub the greek spice rub on the lamb shanks. Cook on low for 8 hours or until tender. Hi Alyssa! I LOVE lamb. Is it possible to make this recipe without the sun-dried tomatoes? I have a weird dislike for them, but the rest of the recipe sounds phenomenal. Kristina, you may want to substitute artichoke hearts for the sun-dried tomatoes, they’d go beautifully in this dish and would be true to the Greek roots. This recipe fails to indicate if the potatoes, olives, sun-dried tomatoes and salt and pepper are to go in the pan or the slow cooker.